Vinyl is a direct replacement and superior alternative to almost any style of wood railing, decking, or fencing. These products are made from the same materials as vinyl siding and vinyl windows, which makes them a low maintenance product that never needs painting or staining. Our goal is to simplify your life by providing the best maintenance-free products available. What’s more, our commitment to exceptional service and value is the foundation our company is built upon and is represented by every Better Than Wood project. 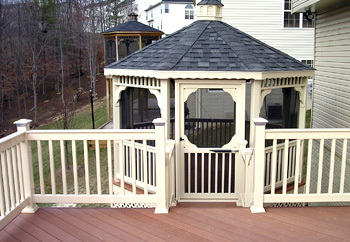 Therefore, we offer high quality maintenance free decks, porches, railing, and fencing with outstanding customer service. An investment with Better Than Wood is a long-term contribution to your home’s curb appeal, a reduction to maintenance costs, and a plus for your resell value in the areas of Prince Georges County, St Marys County, Charles County and Anne Arundel County, Maryland and these communities: Fort Meade, Upper Marlboro, Brandywine, Fort Washington, Greenbelt, Beltsville, Clinton, College Park, Laurel, Hyattsville, Landover, Bowie, Glenn Dale, Mitchellville, Cheverly, Crofton, Annapolis, Edgewater, Waldorf, La Plata, Hughesville, California, Hollywood, Leonardtown, Great Mills, Lexington Park, Solomons, Lusby, Prince Frederick, Huntingtown, Dunkirk and Chesapeake Beach. Instead of being a weekend warrior always working on your deck, fence or porch you can enjoy relaxing on it instead of scraping, painting or finding splinters on it. Here is what we can give you whether it’s a deck or deck makeover, porch or porch makeover, fencing, railings or pergolas. Better Than Wood’s deck definition: A maintenance-free sanctuary to relax and enjoy with your family. All our vinyl and composite deck materials are maintenance-free. They are superior alternatives to any wood product. To give your current deck a makeover, we can build on your existing structural framing and simply replace the decking boards and railings. Deck railing: Custom-built vinyl railing is commercial grade with a limited lifetime warranty. Deck Flooring: Our deck flooring material is backed by a 20-year limited warranty. It offers attractive brushed grain finish in 4 fade-resistant colors: Mahogany, Cedar, Walnut and Driftwood. Fascia board: We use a white fascia board to give a finished look to your beautiful new deck. This fascia board is also a product that never needs painting. Whether it’s new or old, we can build an entirely new porch or replace those old wood porch poles and railings with new vinyl ones! Built for beauty and safety, our porch products offer exceptional strength with railings and posts made of rigid PVC and reinforced with aluminum. Porch posts: Our posts are strong enough to hold any roof overhang. 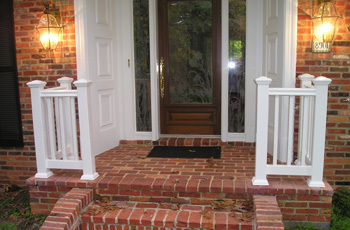 Custom Design: We custom build to fit your porch. Railings will be manufactured to your exact dimensions ensuring you get a professional installation with a great look. Unique Appearance: Our posts are decorative or turned to match your existing wood posts. You can add decorative scrolls, which are also maintenance-free, to complete your porch project. Not many things in life are both attractive and maintenance free, unless you're talking about our vinyl fencing. 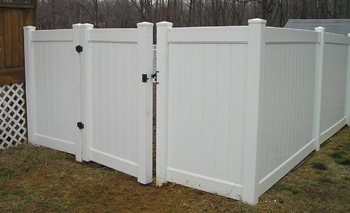 With our fencing, you can avoid some of the problems encountered with wood fencing. Our fencing It will not rot, crack, or peel. It is fade resistant so you do not have to paint or stain it. Our vinyl fencing comes in a variety styles and is available in Tan or White. You may ask why build a pergola? It extends your outdoor living space, makes it more appealing, creates a shady retreat, and serves as a major landscaping component. Our pergolas will not rot, crack, or peel.